Our Just Us Girls challenge this week is not really "wild", but it is pretty cool! Your challenge this week is to make a holiday card with a picture on it. It can be any picture...a personal one of your family, pets, etc., or it could be one you found online, in a magazine, or anywhere else. The wild part is this: If you play this week, you will receive a gift from Kristin. She created a fabulous digital set that she is giving away to everyone that participates! You can see it on the graphic below as well as on the cards the DT has created this week, which you can see on the JUGs blog. Isn't that lamp post fabulous? And the sentiments Kristin has created (including a handwritten message by Tammy Hershberger) are just so wonderful for the holiday season. So all you have to do is play, and you'll be given this digital set! Great huh? Here's what I did with this challenge. I just had to put a picture of my dog, Lizzie, on here! Why would you want to see me or my DH, right? And she's so CUTE! Well, at least I think so! Anyway, I added the handwritten sentiment right on the picture using my editing software. I also resized the lamp post so it was smaller, then printed it out and cut and embossed it with a rectangle nestie. 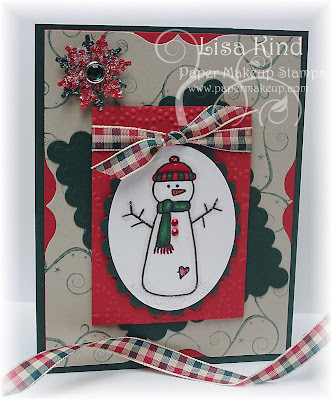 I used this SU paper, Christmas Cocoa (which I love) and soft suede and real red cardstock. The ribbon is also soft suede, and I added the red glitter dots. Super simple card to pull together. So, are you "game"? Are you inspired to make something so you can receive this great set? I hope so! All you have to do is post a direct link to your project to Mr. Linky on the JUGs blog by Thursday, November 5 at 9:00 EST. If you post to an online gallery, use the key word JUGS5. After you play along and post your card in Mr. Linky before the deadline, email Just Us Girls and provide your email address and another link to your photo. One of us will respond with the digital Happy Holidays package just for you! How easy is that? We hope you play along this week. We've had such a great response to our challenge blog after only a month, and we are so thrilled that you enjoy our challenges. This is another way to say "thanks to you"! Thanks for stopping in today, and have a great weekend! Are you getting ready for the snow? Or maybe you already have some (right Holly?)! Well it's coming, and we need to be prepared when it comes to stamping! So Artful INKables is having a winter blog hop! We're showcasing some of the great winter stamp sets in the store that deserve some love! If you've come here from Joy's blog, you are right on track. If not, head on over to the Artful INKables blog and start there. If you leave a comment on everyone's blog by Sunday, November 1, you'll have a chance to win some AI blog candy! How easy is that? 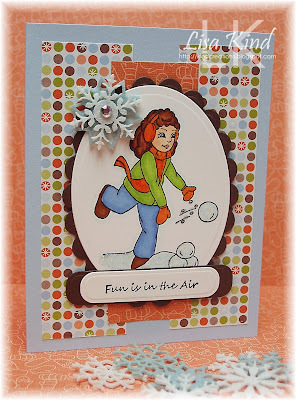 Today I'm showcasing the set Snow Play because I just loved the little girl (and boy) in the set playing in the snow. They just looked like they were having so much fun! Here's my card. I wanted to use some fun bright colors, so I started with SU's retired paper called Frosty Day. This little girl is colored with copic markers and I've put some star dust stickles on the snow, snowballs and her scarf. The sentiment (also from the set) says it all! Remember throwing snowballs at each other? Such fun! 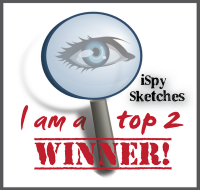 I used Jen del Muro's sketch from last Saturday, but changed the circle to an oval to accommodate my image. Want to see the last one on the hop? Then hop on over to Deborah's blog to see her fabulous creation! Thanks for stopping by today! I have another post today, so please stop by for that one as well! Want some makeup for the weekend? You will love the stuff the Paper Makeup Stamps DT have for you. 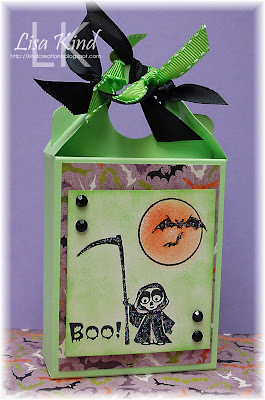 We have a challenge for you just in time for Halloween...make a box or treat bag of some sort. I think all of us went with a Halloween theme for this and here is mine. I made a mini pizza box...such fun and so easy to make! I got mine from Jen del Muro a long time ago (last year sometime), but I'm sure there is a tutorial on SCS in the Resources section. 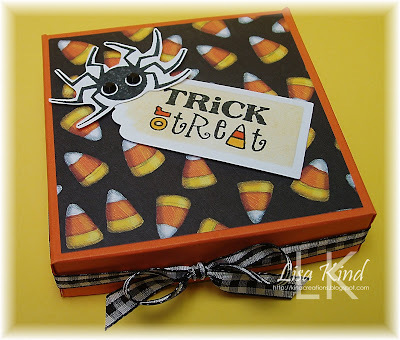 I used a piece of pumpkin pie cardstock as my base, and the dp is from a Halloween stack from K&Co. Boy, this dp has seen some action this year! LOL!! It's really some great paper! The sentiment is from Spooky Sentiment and the bat is from Spooky Solids. I stamped the sentiment in black and cut and embossed in with a tag die. I colored the candy corn with copics. The eyes on the bat are black bling just to give it more dimension, and it's on dimensionals. 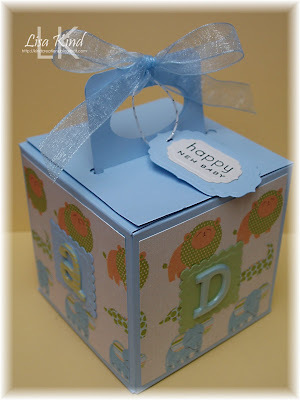 I tied the black and white gingham ribbon around the perimeter of the box and tied a bow. 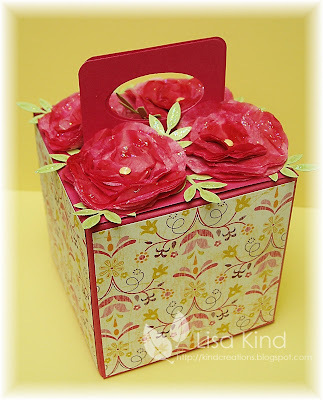 So why don't you stop by the PMS blog to get some inspiration for your creation? There's some fab treat bags to see! If you participate in our challenge, use the key word makeup4theweekend03 if you post to an online gallery and post your direct link to the PMS blog so we can see it! Thanks for stopping in today. Have a great weekend and I'll have another post later! See you then! Hi! What's moo with you? LOL!!! I think that's so cute! Anyway, here is a card I did with one of Artful INKables newest releases called Down on the Farm. I got lucky with this dp...it's from DCWV All Dressed Up. It couldn't be more perfect! And the sketch from SCS yesterday couldn't be more perfect as well! I colored the cow with my W copics and a light R copic for the utters and ears. I added star dust stickles to the black spots (love that stuff). The black strip across the bottom was run through the distressed stripes cuttlebug folder. I added the sentiment and the candy dots, and I was done! 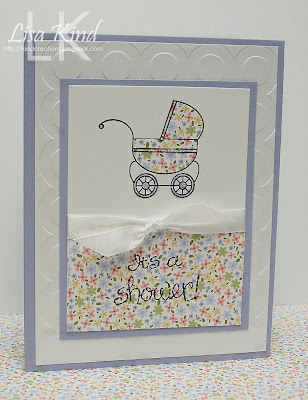 Really a quick card, but so cute (at least I think so!). Stop by the Artful INKables blog and see what's going on there. There are some great samples being shown there from the DT. And for you Twilight fans, you won't want to miss out on their Twilight blog hop that's happening on November 20th (the opening of the New Moon movie). To find out how you can participate in the hop, stop by the AI blog for all the details. Thanks for stopping in today! Today marks my final day as a guest designer for the Color Throwdown for the month of October, and it has been a blast! This week, the colors were a REAL challenge for me! Would you have put these colors together if it weren't for a challenge? I wouldn't, but I guess that's the challenge! I kind of liked it in the end, too! Here's what I did with them. I used a new stamp from Paper Makeup Stamps. It's from the Moody Girl line, and this one is called Moody for Snow. (The sentiment is from the Snow Happy set also by PMS.) I colored her with copic markers in the challenge colors and added star dust stickles to the snowflakes and her clothing. 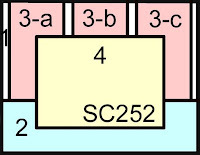 The bordering blue and elegant eggplant rectangles were run through the cuttlebug with a snowflake folder. The background dp is from SU's Razzleberry Lemonade. The satin ribbon is one I picked up at AC Moore that matched the rich razzleberry perfectly. The snowflake is something I had in my stash from last year. I used this week's Mojo sketch, which was also a challenge for me! I'm really challenging myself today! LOL!! If you'd like to try this challenge, post your direct link to the CTD blog and use the keyword CTD66 if you post to any online gallery. I know the girls have some fabulous designs for you to get your creative juices flowing, so make sure you stop by there and leave them some love! I'd like to thank the girls at the Color Throwdown for inviting me to be their guest designer this month. It was truly an honor to be part of their team! I had to go to a baby shower yesterday, and got the mom a gift card. I thought about making a card and putting the gift card inside, but I wanted something prettier than just a card. I had the Get a Handle on It template on my desk from Saturday's JUGs challenge, and when I looked at it, it reminded me of a baby block. So I went with it and created this. 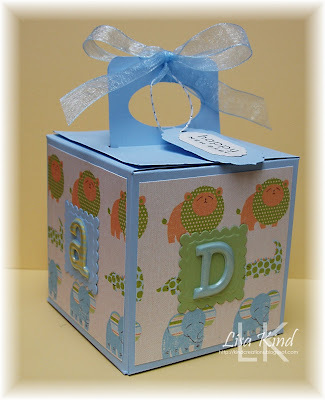 I used Bashful Blue as my base (because they found out they are having a boy) and this paper from the Making Memories Animal Crackers collection. I then cut two blue and two celery scalloped squares from nesties and placed a dimensional letter on top to create a block. (I used ABCD letters, one for each side.) Here's the top to show the tag. I used nesties to cut and emboss the tag, and PTI's Bitty Baby Blessings for the sentiment. I attached it with some string and attached that to a sheer blue bow. Inside is some shredded paper and the gift card! Cute, huh? I really like the way it came out, and you know what? There wasn't another one like it at the shower! That's what I like about creating these things...they are really one of a kind! Well, that's it for today! Thanks for stopping by, and have a great week! Hi all! I just wanted to pop in today and let you know that Paper Makeup Stamps has another Countdown to Christmas promotion going on this week. It's FREE SHIPPING on any order, big or small! The code to use at checkout is 1024FREESHIP. It's a great deal and there are some fab stamps and other great stuff there! You have all week to cash in on this deal! Don't miss it! Hi everyone! Are you ready for a cool 3-D project from Just Us Girls? Mona has a fantastic video to share with you on the JUGs blog showing you how to create these fabulous tissue paper flowers! Here is what I came up with for this challenge. I used Lauren Meader's My Timeless Template called Get a Handle on It to display my flowers. I started making the tissue paper flowers in Melon Mambo according to Mona's instructions, however I only used three layers instead of four. I wanted mine smaller in size. I attached them with So Saffron brads. I added leaves punched with a Martha Stewart frond punch in Certainly Celery. The base of the box is Melon Mambo and the dp is Razzleberry Lemonade by SU. After it was all pulled together, I added my beloved star dust stickles to the flowers, brads, and leaves. I HAD to have some sparkle on my flowers! LOL!! You should stop by the JUGs girls' blogs to see what they did with Mona's flowers. Here are the links to their blogs. Now you need to stop by the Just Us Girls blog and watch the great video tutorial that Mona created. We'd love for you to try this technique and put it on a card/project. Link your direct post to the JUGs blog, and if you upload to an online gallery use the code JUGS4 so we can find it. We can't wait to see what you've done! Thanks for stopping in today and have a great weekend! Hi there everyone! I'm back with another Guest Designer spot for the Color Throwdown challenge. We have a very interesting color combo for you today. I wasn't sure what I was going to do with this one! 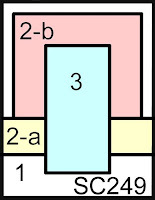 I started by pulling out cardstock in these three colors, then looked for dp. I found SU's retired Bali Breeze had the teal and pomegranate in it. So I went with it and this is what it evolved into. Stamping Bella is the sponsor for this week's CTD challenge and I was given a couple of these Ketto stamps to use. I chose this one called Kenya Ketto. So cute! I colored her with copics in the three challenge colors (I cheated a little on the celery...I didn't have a copic to match celery, go figure!). I cut and embossed the image with circle nesties. I added star dust stickles to her and on her wand is an embellishment I was given from Stamping Bella, but I don't know what they are called! There are two sizes of this "bead" and they are sparkily too. The sentiment is from PTI and the sketch is this week's Taylored Expressions sketch. I added the Purely Pomegranate stitched ribbon to finish it off. If you'd like to take on this color challenge, visit the Color Throwdown blog and link your direct post to Mr. Linky there. If you post to an online gallery, use the keyword CTD65 so we can find it. 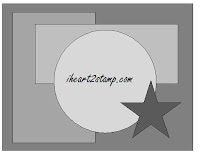 On another note, Paper Makeup Stamps has changed their Friday Freebie to Wordart Wendnesday. They have a FREE digi for you today so check it out here. Thanks for stopping by! 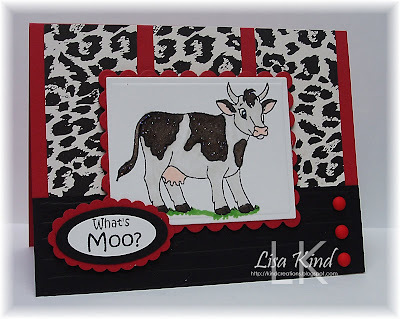 Artful INKables has two new releases this month, and I have a card to share with you today from the set called Down on the Farm. It's a really cute set with some farm animals, scenery, and sentiments. I had this card designed in my head, and it took quite a while to pull it together for some reason! But it's finally done and I really like it! 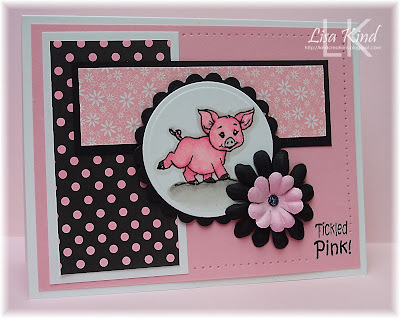 I wanted the card to be black/white/pink, so I started with the black polka dot paper from PTI's Black & White Basics. I colored the white dots with a pink copic marker. The white dots were too stark. The pink dp is from an SU hostess stack in pretty in pink. I used Jen del Muro's Sketch for You to Try from yesterday. I paper pierced part of the card because it just looked too plain! It's amazing how something like this adds so much! I'm here today with our third Just Us Girls challenge! We had such a great response last week...we were all truly shocked at all the entries! Every time I looked at the blog, there were more entries! I was very overwhelmed! Thanks so much...you like us, you really like us! (Just channeling Sally Field there! LOL!) I want to congratulate Rosemary for randomly winning our blog candy and Broni for being the "Chic of the Week" with her fabulous Addy Tude card! Congrats girls! This week, we have a fantastic color challenge for you by our very talented and sweet Dana Gustafson. Aren't these fantastic colors? I just thought Christmas and a sort of shabby chic look. These are Papertrey Ink colors, but you don't have to use them...they are just for reference. Here's what I came up with. 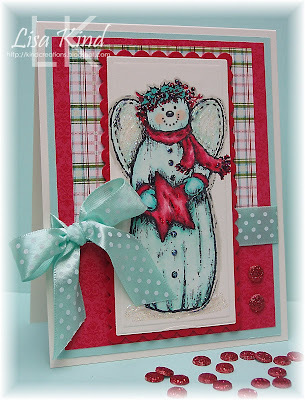 I just bought this Snow Angel stamp by Serendipity Stamps from my LSS, Buffalo Stamps & Stuff, last weekend, and this card has been swirling around in my head all week. I stamped the image in Memento tuxedo black on Vintage Cream cardstock. I initially thought I was going to color the snowman a light brown color, but then decided on this great aqua color. I liked it much better! I added star dust stickles to pretty much everything on him...I just love that stuff! The plaid dp is Basic Grey's new Eskimo Kisses. (It has some pink in it in honor of Breast Cancer month!) The red dp is from SU's new Christmas Cocoa (it's in the Holiday Mini catalog). I used some Aqua Mist satin swiss dot ribbon by PTI. Lastly, I added some red glitter dots. I followed the SCS sketch challenge from last week. Want to see more? Here are links to the Just Us Girls DT that you can visit. Please leave some love for their hard work. So what do you think you can do with these colors? We'd love to see! If you play, please post your direct link to the Just Us Girls blog so we can see them! If you post to an online gallery, please use the keyword JUGS3. Dana has thrown in some blog candy for a winner, too! She made these amazing flowers on her card and is offering a bag full of them! Thanks, Dana! On another note, Paper Makeup Stamps is in it's third week of the Countdown to Christmas sale! This week, all embellishments are 30% off! That's right...30% off! The sale runs all week and the code at checkout for the discount is EMBELLIE30. Make sure you check that out! Thanks for stopping in today! Have a great weekend! Paper Makeup Stamps challenges has made a move to Fridays by popular demand, and we've changed the name from the PMS Monday challenge to Makeup for the Weekend challenge. Pretty clever, huh? We thought so! So our first challenge is to make an ATC (artist trading card). They are a small canvas on which to work (2.5" x 3.5"), and they are usually traded. My ATC is pretty simple, but cute, and I liked it so much that I didn't want it to be left alone, so I attached it to a card right away. Here's my ATC. 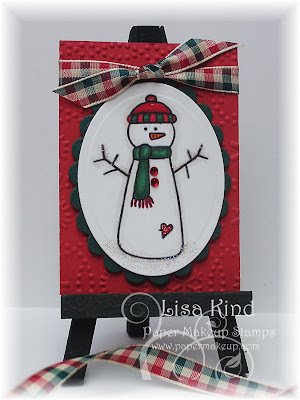 I had this smaller snowman from Snow Happy, a PMS new release, all stamped and ready to go. I took my color direction from this ribbon I just picked up recently. The riding hood red piece was run through a snowflake cuttlebug, and the image is mounted on a piece of handsome hunter that was run through an scalloped oval nestie. The image is colored with copics and I added star dust stickles (of course). I placed two small red crystals where his buttons should be. Cute, easy, and FAST!! So he was so cute that I couldn't just allow him to be left alone. I attached him to a card...I don't trade these or do swaps, therefore he became a card! Here's the card with the ATC attached. I took a piece of sahara sand (which matched my ribbon) that I had on my table from another project and stamped it with a swirl from Dream Big in handsome hunter. The ink was very dark, so I stamped off the ink before stamping it on the sahara sand. I punched the sides with the MS flourish punch, and matted it on a piece of red so it just peeked out from behind. That was all matted on a handsome hunter base. The snowflakes were punched with another MS punch. I covered them with glue and sprinkled some chunky glitter on top. This is something I saw my friend Cheryl Rowley do, and she originally got the idea from Anna Wight. I placed a green crystal brad in the middle. That's it! It was a very easy and fun card to do! Doing that little ATC really helped forge my creativity! We'd love to see what you can do with an ATC. Stop by the PMS blog to get some inspiration for the weekned! You can post the direct link to your creation to Mr. Linky on the PMS blog. If you post to an online forum, please use the key word (it's a long one!) makeup4theweekend01 so we can find your cards. Thanks for stopping in today! Have a great weekend! Today is the release of two new sets from Artful INKables called A Bird's Song and Down on the Farm, and we are hosting a blog hop to preview these new sets. You should have arrived from Jen's blog. If not, please hop over to the Artful INKables blog and start there. You don't want to miss all the great projects the AI DT has for you to see! I'm previewing A Bird's Song today. When I saw this, I was extremely excited! 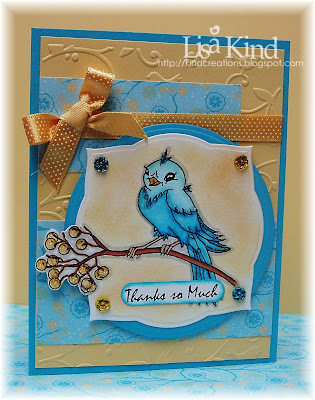 It's such a pretty set of two birds, some sentiments, and accent pieces. Isn't this bird just gorgeous? See, I told you it was a great set! I colored the image with copics, then sponged in some So Saffron ink in the background. The berries on the branch is a separate stamp that fits on there perfectly. All you need is your stamp-a-ma-jig to place them on there just right! I cut around them before I cut out the image with this nestie. Our very own Joy has a tutorial on how to do this technique on the AI blog here. I put star dust stickles on the berries and the bird and added the flower rhinestones in yellow and blue in the corners. The sentiment is also from the set. I used Jen del Muro's sketch from last Saturday. Artful INKables has a great sketch challenge for the Think INK Tuesday Challenge for you this week, however it just didn't work for this image I chose to use. I'll have one done with that sketch later...it runs for two weeks so I have lots of time to make something with the new sets! 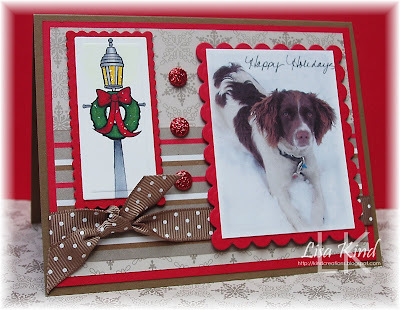 Now you have to hop over to Sherry's blog and see her fabulous creation! Thanks for stopping by today and enjoy your hop! Hi everyone! 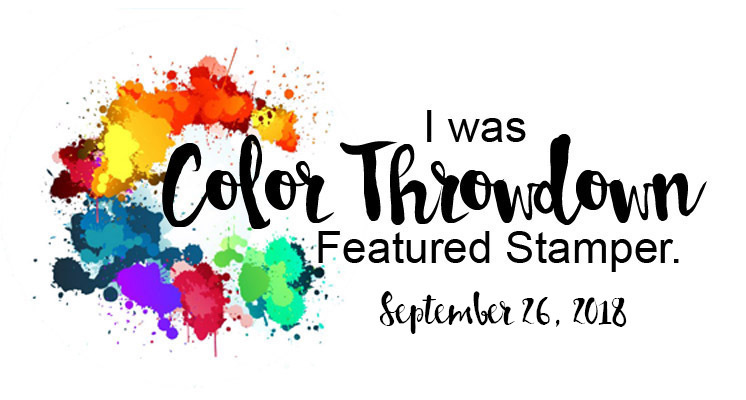 Today is my second week of being Guest Designer for the Color Throwdown challenge blog! I'm late posting this because I wasn't feeling well...I found out I have bursitis! Pray you never get this because it's very painful! Anyway, I did have my card done on Monday night, which is a first for me to have something done two days in advance! LOL! Anyway, here are the colors for this week. I KNEW I could handle this one! I just love chocolate and blue together! Today's sponser is Simon Says Stamp and they are offering a $20 gift certificate with free shipping! They also gave me the cutest animal images to work with called Zoo Animal Vacation. Here's what I did. 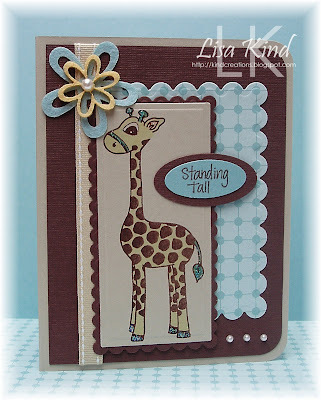 I used the giraffe in the set because I really think they are an amazing animal! He's stamped in Chocolate Chip on the Sahara Sand cardstock and then colored with the Y00, Y000, and Y000 yellow copic markers. I also used B52 blue to accent his horns and tail. I added Star Dust stickles to them as well. The Chocolate Chip cardstock is the textured kind for more interest. I went through my extensive stash of dp and came up with SU's retired Urban Garden. The ribbon is actually River Rock, but it looks so much like Sahara Sand! The accents are also from Simon Says. 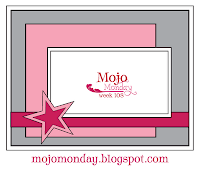 I used the Mojo Monday sketch from this week as my starting point. , but flipped it to accommodate my image. So what do you think? Can you handle this color combo? If so, please link your direct post to Mr. Linky on the Color Throwdown blog and use the keyword CTD64 if you post to an online gallery. Thanks for stopping in today! 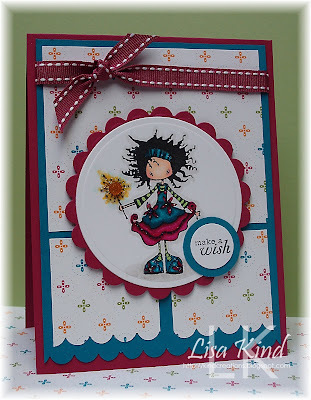 Tomorrow we have the new releases from Artful INKables and a blog hop to show them off! Please stop by again! Ok, I'm off my soapbox! LOL! I stamped each of the three images from Halloween Hauntings with Memento Tuxedo black ink on SU's Shimmery White cardstock. I was going for more of a shimmery look instead of a flat look. Since there was no coloring involved, I added some to the moon and the background with an ink pad and sponge. I attached it to the box with dimensionals, then added star dust stickles to the images and the black crystals. It really jazzed it up! And because I added sparkle, it qualifies for the Artful INKables Think Ink Tuesday challenge that ends today. 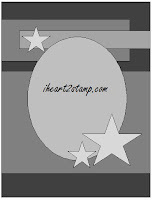 You could win a grab bag of AI stamps! It also qualifies for the 2Red Bananas challenge to make a Halloween project (I just realized that I'm a day late and a dollar short for that challenge!). 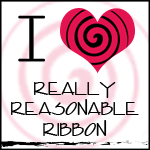 And what do you think of those ribbons? I tried a few things and this seemed to be the best of them. The black ribbon sort of looks like bats to me! LOL! Also please note that the Paper Makeup Stamps challenges have changed from Mondays to Fridays. We're calling it the Makeup for the Weekend Challenge. And Friday Freebies have changed to WordArt Wednesdays. Hope you have a great Monday! Thanks for stopping by today! Just Us Girls Challenge - New!! Hi everyone! It seems everybody loves a challenge these days! Since the My Time to Create Challenges have come to an end, some of the girls on the team wanted to stay together and create a new team. So we came up with the Just Us Girls Challenge. 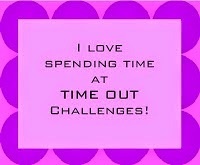 We have a new blog and we hope that you are going to love the new look of it and the fun challenges! Each week we will choose a "Chic of the Week" whose card will be featured on the blog each Friday. 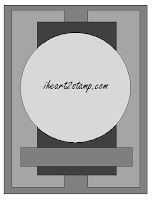 You'll receive a blinkie to proudly display on your blog. Pam is hosting our challenge this week, and she has chosen a technique I use quite often...paper piecing. And since this is Breast Cancer Month, we've thrown in the option to use pink on your card. Isn't that a cool graphic? 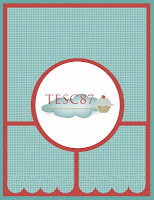 The girls have really rocked the graphics for the blog, let me tell you! I was so excited when I heard that paper piecing was our challenge because I had just finished making 20 baby shower invitations for my nephew and his wife last weekend that I paper pieced. Here's my take on the challenge. This photo is somewhat washed out...it's much more colorful IRL. I used SU's new dp from their Holiday Mini catalog called Pawsitively Prints. The white mat was run through the cuttlebug using a Quick Kutz folder (I think!). I added star dust stickles to the carriage, too! A tip for you when paper piecing: use your Xyron machine. Remember that sticker making machine that you HAD to have? Well dust it off and use it for paper piecing! I always use mine for this technique because I usually have small pieces cut out and putting glue or tape on them is so difficult. Running it through the Xyron makes it much easier! Just Us Girls blog by Thursday, October 15 for your chance to win! If you post to an online gallery, please use the keyword JUGS2. It might be nice to stop by the JUGs DT to leave them some love. Here are the links to the girls' blogs. Thanks for stopping in today, and I hope you enjoy our new challenge! Have a great Columbus Day weekend to my US friends and a Happy Thanksgiving to my Canadian friends! Enjoy it with friends and family! Hi all! Well, it's been pretty busy here at Kind Creations this week! Lots of stuff going on, and I've been BUSY!! Don't you just love when you have something ready to just pick up and go? That's what happened to me last night. It's Thursday, so I had to create something last night (because I do everything at the last minute!) for my weekly Artful INKables post. I was very tired last night and it was 8:00 before I even made it down to my stamp room. Then I realized I had this Lauren Meader Christmas stocking that I made a few weeks ago that I could add an AI stamp to. Now I have to admit that I cased this from the ideas that come with the templates (this template is a FREE one by the way). 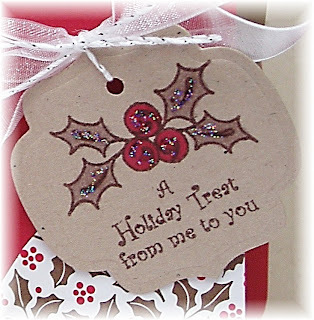 I just added the tag I created with AI's most recent release Holiday Treats & Tails. These are two separate stamps that were perfect for this project. I colored it to match the dp (no green leaves here!). Here's a closeup of the tag. This also qualifies for the Think INK Tuesday challenge from me...to use sparkle on your card. I used star dust stickles on the holly. 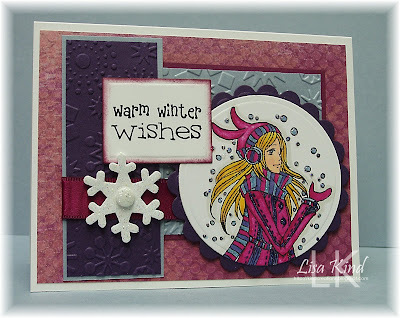 You can find more about this challenge on the Artful INKables blog. You have until Monday to get your challenge in, so check it out! With all these Christmas cards and projects I've been doing, I'm going to be all set for Christmas! That'll be a first! Thanks for stopping in today. Have a great day!